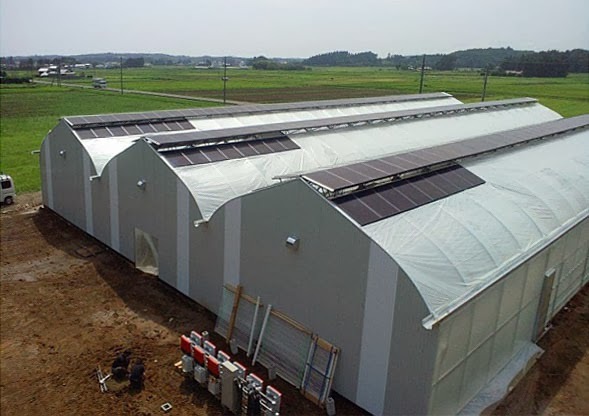 The "Greenhouse PV Demonstration Project" in Fukushima is a project to test how much impact the shading caused by the solar panels affects the growth of the fruit and vegetables inside the greenhouse. Fukushima, the name synonymous with 2011's Japanese tsunami and subsequent nuclear accident, is an area of Japan that has been treated with so much care since the disaster two years ago. It is no surprise then that the Japanese government is much effort in providing power supply from other sources. So, as part of the economic recovery efforts, solar panels have been fitted to an agricultural greenhouse for a demonstration project in Minamisoma, Fukushima. The project, by companies including Japanese panel maker Solar Frontier and German EPC Belectric, in cooperation with the local prefectural government of Fukushima, sees installation of 324 Solar Frontier panels with 50kW total rated capacity covering 1,300m² of roof space on an agricultural greenhouse. The results of the project are due to be reported in January, 2014, to determine impacts of shadows from solar panels on high value greenhouse products. TheGreenMechanics: Would be good to test this solar PV shading on our paddy field and see if there is much impact on the amount of rice produced as a result. At the same time, free electricity from the farm. Sounds good, eh?